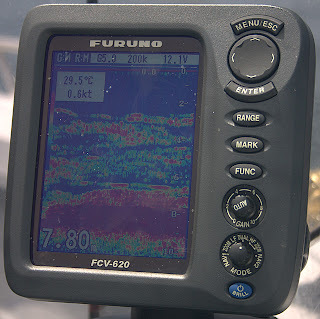 As promised, here is part two of my Furuno 620 review. I managed to get a couple of photographs today of the beast in full swing. This first photograph show the sounders ability to hold bottom at speed. In the top left hand corner you can see the boat speed is 23 knots. Obviously the water is only 6m deep, and the conditions were good. In rough weather or choppy conditions I do get gaps in the reading as air passes under the hull. But generally the bottom is held very well. This second photograph shows how even small bottom features will show at high speed. Again the boat is doing almost 23knots. The bump shown is an underwater pipeline, probably no more than about 30-40cm high. Even bait and fish sitting on the structure will show at this speed too. This is a critical feature of any good quality sounder. Being able to hold bottom at speed and identify tiny bottom features will allow you to find new fishing grounds while on the move between locations. I have found many small patches in this way! This photograph shows predatory fish hanging over a hard bottom structure. Possibly reef or wreck. The thickness of the red bottom line indicates the hard structure. Fish in this case I think were small Nannygai. But Mackerel will show up similar. Mackerel are usually a little ‘tighter’ in their pack. It takes a wile to 'trust' your sounder. But every red blob on the sounder is an individual fish. 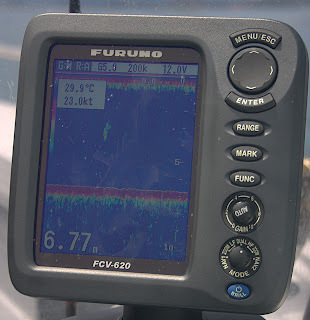 When I first started using this sounder I found it difficult to believe that it was fish that were showing, and often dismissed the readings as 'clutter'. 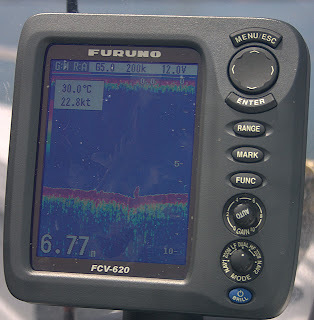 But this sounder is VERY good, if it shows something then you can trust that its fish and not interference or clutter. And finally, this photo shows a bait school with predators sitting underneath. Notice the bait school shows as more of a continuous shading rather than individual solid reading. The solid readings to the bottom are the predatory fish. These photographs are not fantastic. 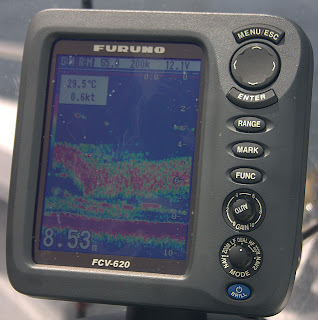 But I hope it gives some idea of how things look on the Furuno FCV-620. This is a top quality sounder and highly recommended.